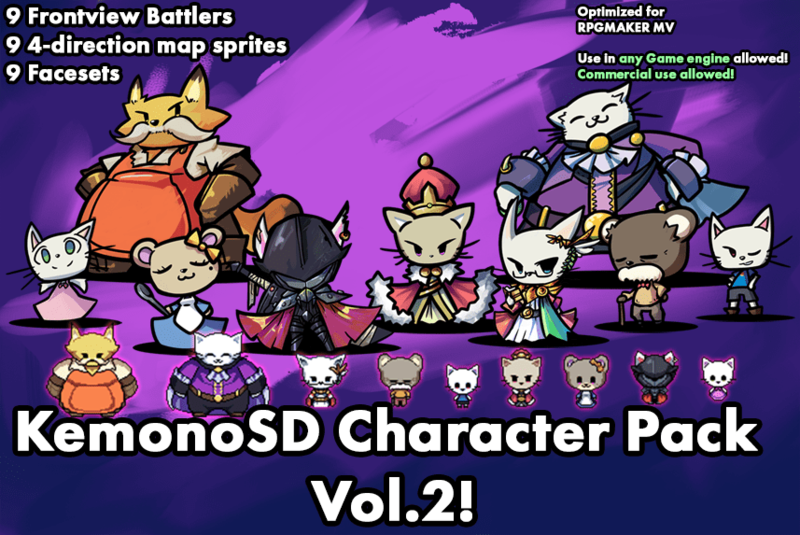 KemonoSD Character Pack Vol.2 ! The second entry in the KemonoSD character pack series ! Volume 1 focused around the foundations! Volume 2 focuses around key npcs commonly needed to truly get your adventures rolling! Frontview and mirrored Battler, 8-Emotions Faceset(Except for the Guild Master who wears a helmet, thus the faceset only has one portrait ) and 4-direction map sprites for the following characters are included! Thanks for supporting Volume.1 and making Vol.2 possible! Looking forward to future expansions to these sets! Got any ideas or suggestions for future KemonoSD expansions? Let me know! This pack is optimized for RPGMaker MV but you can freely use it in any other game engine, though you may need to reformat the assets to fit other standards! Don’t forget to check out Volume 1 if you haven’t, as this pack is an expansion to it! Also to celebrate Vol.2’s release, both this and and Vol.1 are currently on sale! 20% off in each pack! Librarium Animated – Legendary Knight Remment !